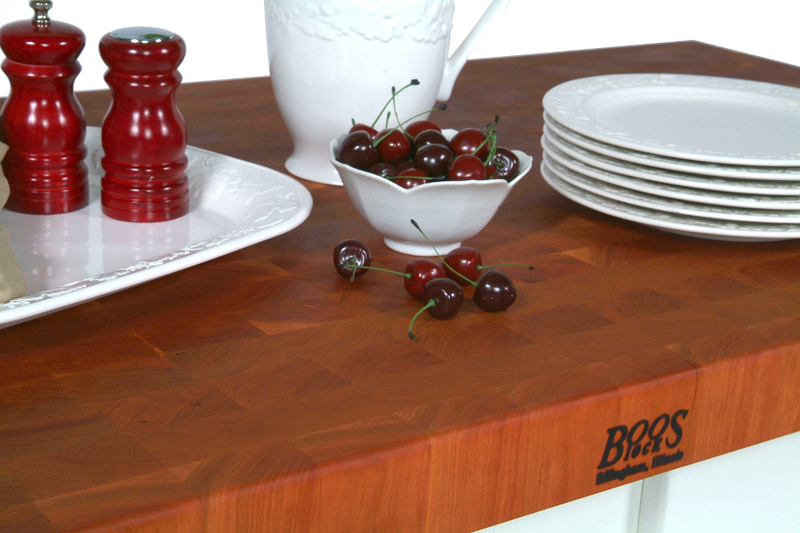 Lengths: 24”, 30", 36", 48", 60"
Note: This END GRAIN Cherry counter top comes with the Boos logo centered on the edges of both long sides. If you prefer NOT to have the Boos logo stamped on your counter top, please indicate so in the "Comments" box during checkout. Note: Natural cherry wood is lighter in appearance than cherry-stained wood. Also, its color can vary with the ratio of red heartwood (core of the tree) to light pink sapwood (between the core and the bark). Finally, cherry wood will appear light in color when new, but will darken over time. 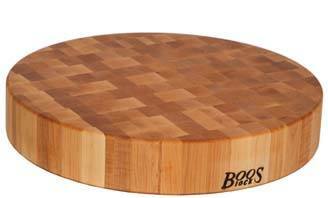 Note: Boos recommends against any type of modification to an end-grain countertop. Cutting into a countertop (e.g., trimming its length or width or executing miter cuts or cutouts) will void the manufacturer's warranty. If you need a custom size, a miter cut or a cutout, please call for a price quote on factory-warranted custom cuts. 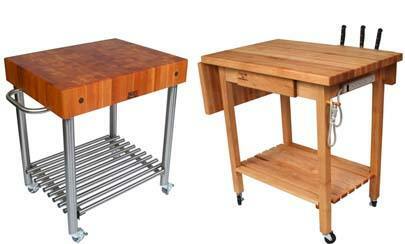 Put A Cherry On Top Of That Kitchen Island – A Luscious Cherry End-Grain Butcher Block! 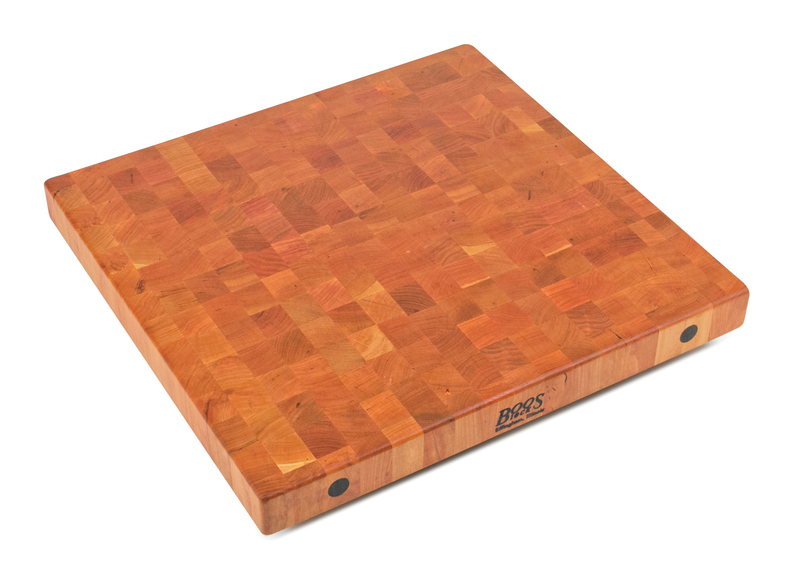 Imagine pairing sumptuous American Cherry hardwood with stylish end-grain butcher block! Whoever said you can’t have it all? 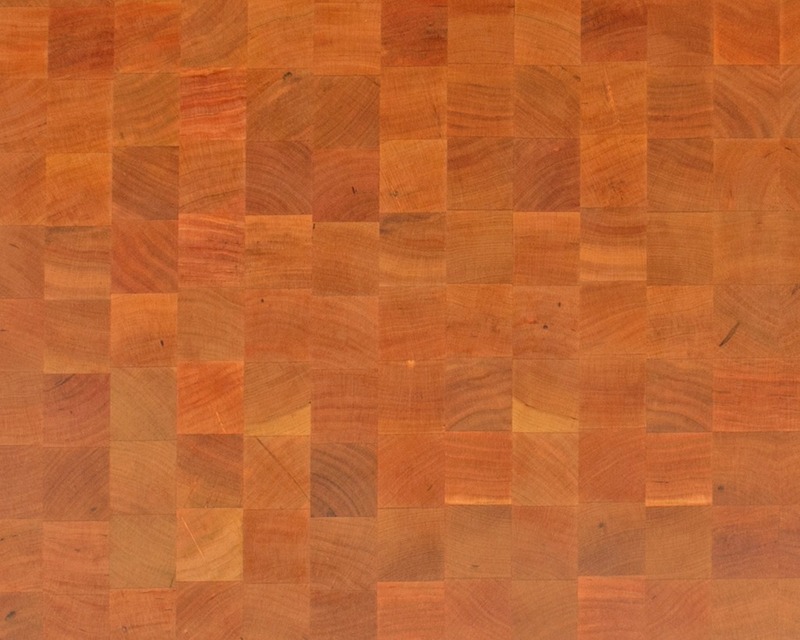 Add to the pale pinks, dark reds and hints of gold or copper that make cherry so tantalizing the intricate, checkerboard look of end-grain butcher boards. 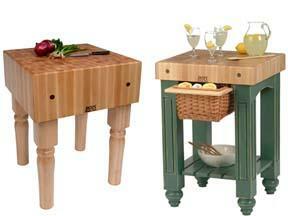 It’s a vibrant combination that’s sure to bring your kitchen to life. Even better, over time, American Cherry can darken and further enhance your kitchen with a deep, burnished glow. These gorgeous countertops are made by bonding together strips of cherry wood standing side by side in a grid. To accomplish this, adhesive, pressure and heat are applied over time. The resulting block is not only extremely strong, it’s stunningly beautiful. Resembling a checkerboard – each square smaller than 2” x 2” – its surface captures the diversity of colors and textures of the cut wood ends. The wood fibers that comprise the board’s surface form a nearly perfect surface for heavy-duty cutting and chopping. Since wood fibers are quite resilient, they can withstand sharp blades and sekdin revealing telltale nicks and gouges. This is equally good for your knives, cheese hatchets and other sharp implements, which will be less prone to premature dulling. 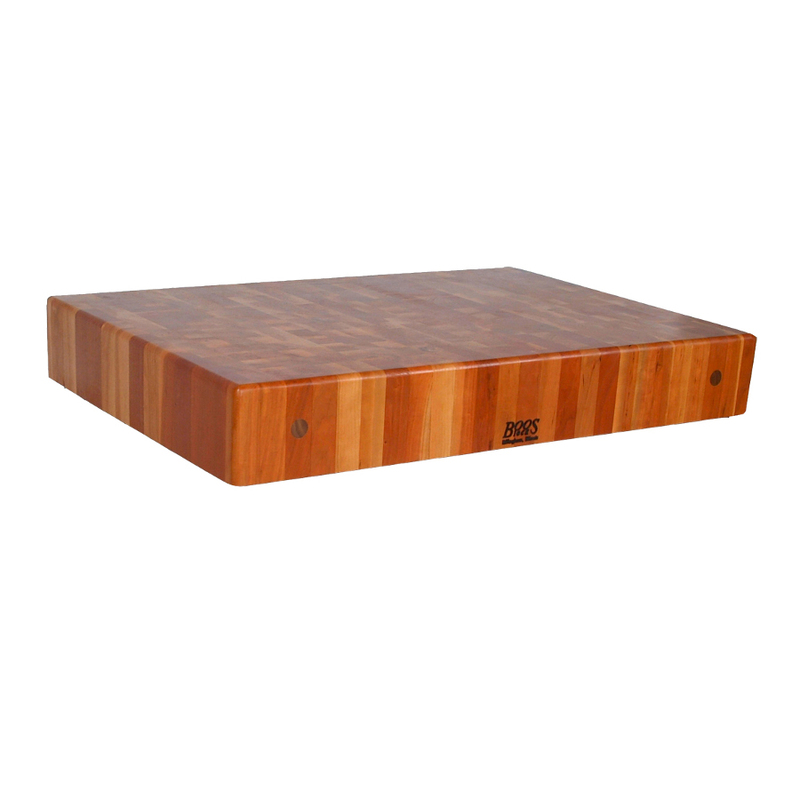 Food-safe natural oil helps protect and preserve butcher block. It penetrates the wood’s surface and seals its pores to help prevent drying and cracking. It’s important to re-apply oil or cream to butcher board at least monthly in order to keep it looking great and to extend its useful life. For this reason we strongly recommend that you add Boos Mystery Oil or Board Cream to your order. The re-oiling process is easy. Simply pour a generous amount of oil on the block and use a clean, soft cloth to spread it around evenly. Wait for the oil to soak in then remove any excess. John Boos & Co. has been making butcher block since 1887, so they’ve had ample time to perfect the process of converting hardwood timber into beautiful as well as practical kitchen furniture, countertops and cutting boards. They’re known for fine workmanship and firm commitments to quality and sustainability. Butcher block countertops are not an inconsequential investment for a homeowner. So invest in a well-known brand name you can trust. Whichever countertops you choose, Boos will make them to your specifications. 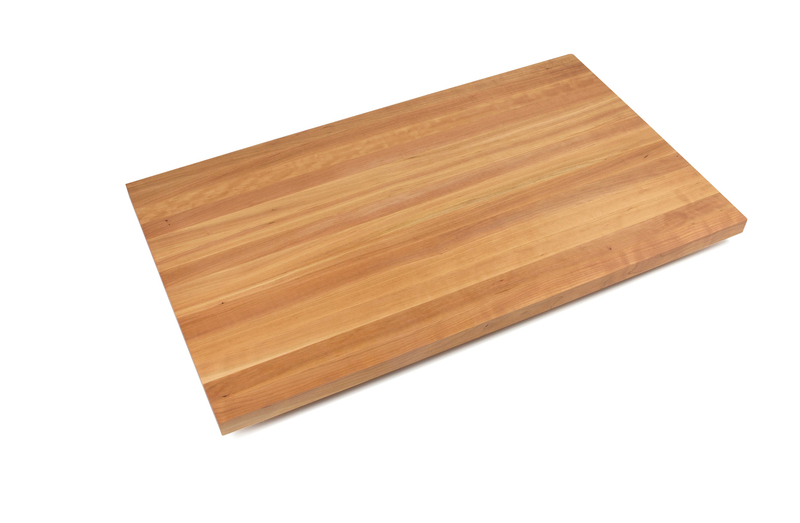 Cherry end-grain boards come in four thicknesses – 2.25, 3, 4 and 7 inches – and in standard sizes as small as 24”L x 25”W and as large as 60”L x 38”W. If you need a custom solution you can compare prices of different species and grain combinations using custom calculator. It’s a quick and easy 4-step process. 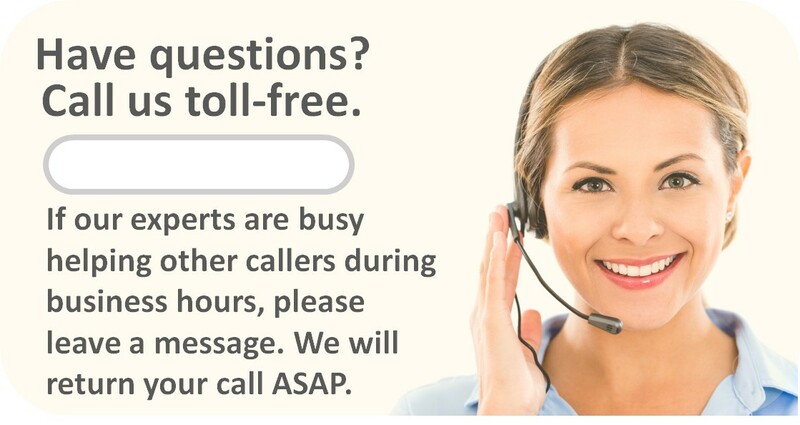 Or if you prefer, call us toll-free for personalized assistance from one of our butcher block experts.